Mama J was frightened into near submission last Wednesday morning when she had to go visit her worst nightmare. No not the Spider enclosure of the local zoo (okay so that actually maybe worse in hindsight) but a TOY SHOP! To steal herself for the occasion Mama J went into Pets At Home which other than M&S is her favourite shop. She went to get me a little pick me up toy from the pet store, as she didn’t want me to feel left out when she bought an all singing all dancing baby toy into the house. She got me a squeaky Monkey which she said to the gentleman serving her, “It looks a little like a Squirrel so Elsie will enjoying running around with it just like she enjoys chasing the Squirrels in our village!” The man looked at her strangely and as if to say, “Don’t you know anything about animals you silly lady? It’s a Monkey!” but then just enquired what sort of a dog I was. Now that’s good customer service, letting the customer think they are always right even when they are clearly deluded. Mama J should really know better as she read the latest edition of her World Wildlife Fund’s (WWF) supporters magazine all about the excellent work the charity are doing for wildlife and conservation from cover to cover. Anyway once she got me my present it was onto the main event for that morning, Toys R US! The reason is that our very good friends have had a little boy and Mama J couldn’t find anything suitable on the Argos website to spare her from going large (in terms of toys) in a toy shop. When she looked she found under the age bracket of 0-6 months a Thomas The Tank Engine set that when clicked upon revealed it was for a four+ year old with a child ready for their first day at school playing with Thomas and his engine pals. Numbers obviously aren’t Argos’s strong point. On walking into Toys R Us she was met with a kaleidoscope of colours and noise, lots of noise! Now this was about 10.30am on a Wednesday morning when most of the little cherubs would be at school, however it was still a little like a kids birthday party with screaming of, “Mummy I want that one!” while the child was frantically pointing at the latest Frozen toy with Elsa and Olaf plastered all over it. The noise of the Frozen soundtrack followed Mama J around the store as “Let It Go!” blasted out from a microphone with a little tot singing along. Oh dear it wasn’t The X Factor standard I can tell you. The last time a Disney tune was so brutally murdered was when Katie Price and Peter Andre decided to release their version of A Whole New World from the film Aladdin. The indescribable feeling they sang about was that of a person with the strongest of stomach constitution reaching for the sick bucket and retching! After a brief look at the baby clothes with Mickey Mouse and yes more Frozen pictures emblazoned across them, Mama J reached the back wall where all the noisiest baby toys were kept. If you can’t beat them join them she thought as she pressed the buttons on a bright yellow Lion who started singing all about the colours of the rainbow. Perfect that was the toy Mama J was going to buy. On queuing up at the till Mama J heard coming from the distance those immortal words of “Let It Go. Let It Go!” Oh no it was the little girl and her Mum waiting in line to pay for her Frozen microphone! Mama J swiftly paid and left the store to the safety of her car, phew! On presenting the singing Lion to her proud friends they pressed the Lion’s tummy and when it played joyfully once they enquired, “Where’s the off switch?” They are going to have fun in a few years time when Disney release their latest singalong film. I’ve had a few inspired moments this past week where Mother Nature has most definitely played her part. On Tuesday evening Granny and I set off for our evening stroll in what I’ll describe as light drizzle which then turned into lashings of pouring rain as we got to the middle of our usual circuit. Granny was sensible and had a coat on, I was ever the optimist and didn’t wear my wax Barbour inspired jacket and got absolutely soaking wet. Now when I say wet I mean dripping like I’d been for a colossal swim across the English Channel. I was shivering as we quickly scuttled back up the road and into the dryness of our house. On telling Mama J she started looking for a Fisherman’s outfit of yellow rain coat and matching hat to protect my head, which is my most vulnerable area when wet. What a fetching get up that will be for me to wear! Just call me Captain Birdseye’s pooch and I’ll be done. At the weekend Watson (love of my life) and I were playing patiently while Grandpa and Watson’s Mum chatted when we both spotted Peter Rabbit (we don’t if that was his name but if its good enough for Beatrix Potter’s character its good enough for me) bobbing along the wall. However he spotted us and as we charged towards him with such gusto he ducked behind the wall until we were safely distracted by our owners with some yummy treats. Grandpa told me when we got back that Peter had moved on into the fields while Watson and I weren’t looking. Cheeky Grandpa he could’ve been Watson’s and my lunch. Forget Lady and the Tramp’s spaghetti we want Rabbit Pie! Our pesky Squirrel was back to torment me over the weekend as he danced on our railings once more. I got so enthusiastic with my window pursuit of him that I must have looked like I had distinct rage issues, as I was quivering so much that I think Granny was ready to call in a Therapist to sort my anger issues out. Now talk to the group if you will! After my wet walk on Tuesday I was left sickening for something on Wednesday. All day I was quiet (well apart from when the post came flying through the letterbox or a Horse galloped passed the window) and just laid of the sofa while Mama J tried in vain to win me around with a loving stroke or a biscuit treat. Then on Wednesday evening whilst my family were watching The Nation’s Favourite Dogs I started lapping my mouth with my tongue and scratching my jawline. Mama J’s concern of the Yorkshire Terrier only coming seventh in the poll (who does this survey anyway) and turned to me as I was uncharacteristically for an evening sat on the floor with Grandpa rather than laid in my usual position on my cushion next to Mama J on the sofa. Everyone kept asking me, “What’s wrong Elsie?” unfortunately I can type but I can’t speak in human vocal form. Anyway it was concluded that I’d either picked up a chill/virus (where’s that Fisherman’s hat again) or my pearly white teeth were playing up again. Granny who is like an action hero went to get the pot of honey from the kitchen as it has antiseptic qualities I believe. 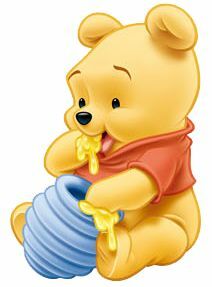 I just like Winnie The Pooh lapped up the honey and my mouth lapping stopped. My family have kept a close eye on me over the weekend and the Vets number is of course on stand up but it’s looking good that I’ve just had a twenty-four bug and was literally just feeling under the weather. To finish on this week I must tell you that I have one extremely proud Mama. She was given a glowing “school” report from Granny on my behaviour over the weekend. No, there wasn’t even an apple of bribery offered either in gaining my accolades, just a whole lot of love given from me to my Great Granny BB who really isn’t well at the moment. I’ve been visiting her with Granny and Grandpa while Mama J was at work and offering her a loving paw and lots of licks to give her a comfort boost. I even gave her an early birthday present of a framed picture of myself looking glamorous which I’m pleased to say made her smile. Right I’m off to stick up my gold stars and polish my halo. Aww. We hope you're feeling better, Elsie. But a Monkey toy? SCORE! Yes thank you very much, the Winnie The Pooh honey went down a treat and seems to be keeping my health gremlins at bay. My Monkey is fantastic as his body is long and I've found the power to make him squeak loudly! Have a great day.